QUESTION: In high school, baseball and softball, the third base coach constantly goes in and out of the coaching box. Coach states he / she is standing outside the lines farthest from home plate. Is this acceptable? Is a warning given? ANSWER: Upon an initial request to remain in box, umpire-in-chief may issue a warning, restriction or ejection for non-compliance. (BB- Rule 3, Sec. 3, Art. 1,i). (SB- Rule 2, Sec. 13. Base coaches are to remain in box prior to release of pitch. SB- Rule 3, Sec. 6, Art. 6). 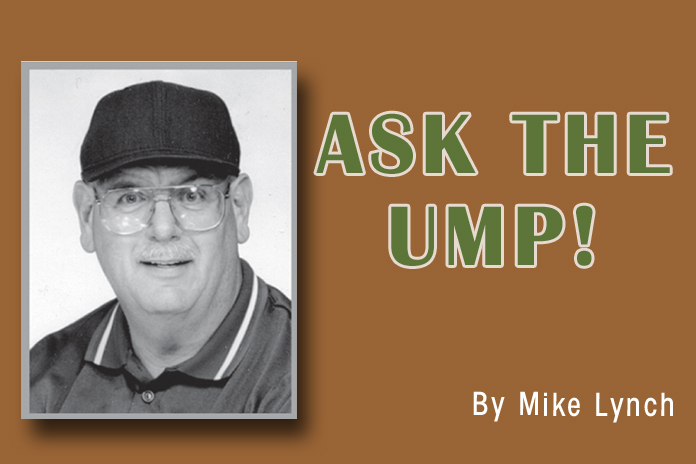 QUESTION: Before the first pitch of the game, plate umpire notices that coaches of both teams are sitting outside dugout on a bucket which has been turned upside down. Home coach claims he/she needs to gives signals from that position. Visiting coach states it is a better viewing area. Legal? ANSWER: Illegal. Coaches are to remain in designated dugout area. Umpire shall issue an initial warning. Any subsequent offender shall be restricted to bench area for rest of the game. (BB and SB- same rules as above apply).